With this book as their guide, readers will discover how to apply our current understanding of the pharmacogenomics of drug transporters to advance their own drug discovery and development efforts. In particular, the book explains how new findings in the field now enable researchers to more accurately predict drug interactions and adverse drug reactions. Moreover, it sets the foundation for the development of drug therapies that are tailored to an individual patient's genetics. 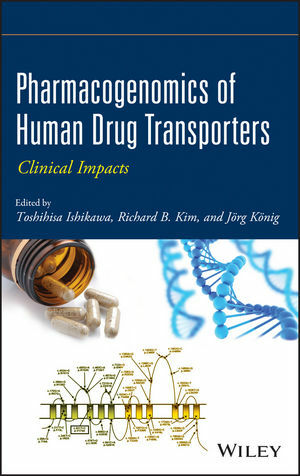 Pharmacogenomics of Human Drug Transporters opens the door to new drug discovery and development breakthroughs leading to safer and more effective customized drug therapies.The book is recommended for pharmaceutical scientists, biochemists, pharmacologists, clinicians, and genetics and genomics researchers. TOSHIHISA ISHIKAWA, PhD, is Senior Scientist at RIKEN Yokohama Institute and Professor of Biochemistry, Molecular Biology, and Pharmacogenomics at Yokohama City University's Graduate School of Medicine. Previously, Dr. Ishikawa was the Director of the Department of Research Technology Development at Pfizer, Japan. A recipient of the Achievement Award from the International Life Sciences Institute (ILSI), Dr. Ishikawa is also the cofounder of the International Transporter Consortium (ITC). RICHARD B. KIM, MD, FRCPC, is Professor and Chair of the Division of Clinical Pharmacology and Associate Chair for Research in the Department of Medicine at the University of Western Ontario. He is a Fellow of the American Association of Pharmaceutical Scientists and an elected member of the American Society for Clinical Investigation. JÖRG KÖNIG, PhD, is Professor and Head of the Molecular Biology Laboratories in the Department of Clinical Pharmacology at the Friedrich-Alexander Universität Erlangen-Nürnberg.